If you are looking for information on the Dryer Vent Wizard franchise business opportunity, Dryer Vent Wizard franchises or Dryer Vent Wizard franchising, then you have come to the right place. This is the Perfect Franchise for You! Let me tell you about an exciting opportunity that fits your profile perfectly! We are involved in creating this industry and have made a niche for ourselves, with very few competitors. Business hours - Monday to Friday 8:30am - 5:00pm. No weekends. Family friendly franchise business. Repeat customers - this is a service business and maintaining relationships, along with providing an excellent service, is the key to success. Low entry cost and overhead - the initial investment is very reasonable and your ongoing overhead is low. Most of our franchisees maintain a home office because the work is done at the customer's location. 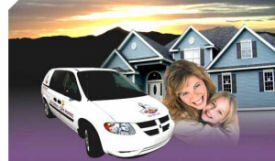 Very few competitors - this franchise has created a niche market and has perfected its service. You will not have many competitors. Fast breakeven and high profits - you will learn that overhead is low, the return on investment is quick and the profit margins are very healthy. Franchise marketing - we are looking for people who have an outgoing personality and enjoy talking about their business. Dryer Vent Wizard - a great fit for you! Dryer vents filled with lint cause dryers to stop operating. Not having dry clothes right away creates disarray in people?s lives. This is why the service becomes an "Urgent Response" call. When a dryer is not working customers call their nearby appliance repair center because they are unaware a dryer vent clog is causing the dryer to stop running or to run inefficiently. If the repair technician identifies the problem as a dryer vent clog, it remains a problem because most appliance repair centers don't offer dryer vent cleaning. Also, certain types of dryer venting do not meet building code requirements and therefore need replacement. Dryer Vent Wizard brings homes up to code requirements and in the process creates a safe environment for the consumer. Dryer vent lint is considered a common cause of house and hotel fires. Customers love Dryer Vent Wizard! When a customer's dryer fails to operate, they typically call a local appliance repair center. If the repair person comes out and finds there is nothing wrong with the dryer and identifies the problem as a dryer vent problem, they usually refer the customer to the Yellow Pages. The customer can't find anyone doing this type of specialized work! This is where Dryer Vent Wizard comes in! Through referrals from appliance repair companies, Dryer Vent Wizard franchisees are connected with customers who need their services NOW at an average ticket of $350 to $400 for approximately two hours of work and a 94% closing rate. This is not a want, but an important need to get the dryer working again! The franchisor does all the up-front marketing, enabling the franchisee to focus on building the business by servicing the customer and networking with appliance repair technicians for referrals. Bottom line is consumers NEED Dryer Vent Wizard's services and there are no organized businesses specializing in it the way DVW does. In addition, repair appliance centers have little or no interest in offering this service - creating a niche market with big margins for Dryer Vent Wizard franchisees. This is why Dryer Vent Wizard has a successful business model and they do it better then anyone else!